My UK publisher partnered up with the Saatchi Online Gallery to sponsor a contest for the book cover. 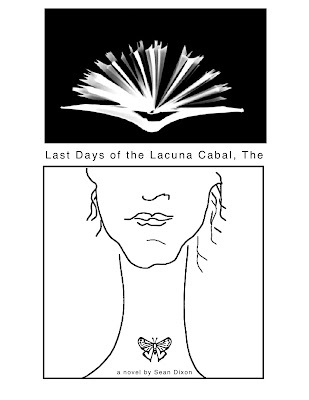 More than a thousand submissions were made, including a few that inspired debates as passionate as anything that had ever been tabled by a member of the Lacuna Cabal. My own mini-essay on the whole experience is here. I prepared a cover of my own to be used just in case people were reticent about submitting. That did not turn out to be a problem, so my submission was never viewed. I'm still proud of it though. It makes use of one of Alison Rossiter's beautiful book images (recorded by placing a book on its end directly on top of the light-sensitive paper and underneath the enlarger), along with the UK edition's butterfly paragraph-divider, and makes me think of Romy's hair, Runner's vulnerable thyroid and the full-on intensity of the LC as a whole. 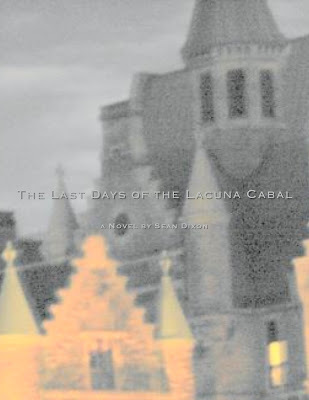 The other two are from way back, when we were trying to come up with a cover image up here (over here? down here?) in Canada. The ghostly building in the top image is from the background of a digital photo I took of the Royal Vic at night. 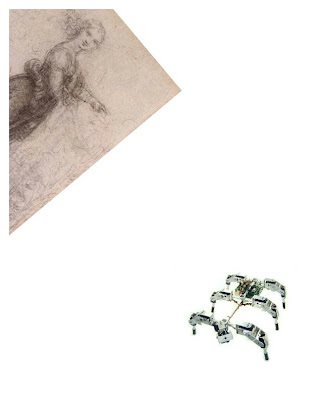 And the last one is a hexapod (swiped from the Internet) being chased down by one of the members of the Lacuna Cabal, as depicted by Leonardo da Vinci. Of course. I made many, many more, before my Canadian editor finally shouted Stop!. But these are my favourites. I remember the excitement of logging on to the Saatchi web page the day after we launched the competition, not really expecting to see any submissions, and being amazed at how many people had gone to the trouble of creating their own book covers. It was quite overwhelming. And the discussions between people were amazing too. It was an exciting experiment and one that we got two amazing covers from too. There's a lot of talent out there.